Last fiscal year, Pima Animal Care Center took in more than 2,100 kittens, many of whom were just days-old orphans who needed around-the-clock bottle feeding to survive. 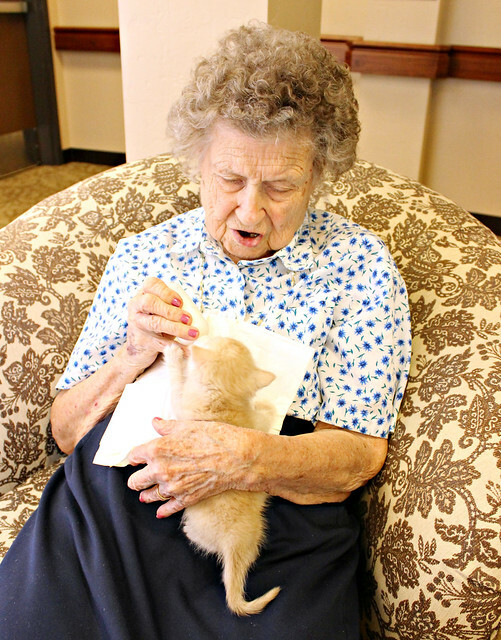 In a novel new program designed to not only save more pets’ lives but also enrich the lives of Pima County community members, PACC has partnered with residents from Catalina Springs Memory Care in Oro Valley to provide the bottle feeding, socialization and love these kittens need to survive and thrive. The first two kittens to go through the program, Peaches and Turtle, are female littermates who came to PACC on Oct. 14 as strays. At that time, they weighed only seven ounces. Catalina Springs Memory Care’s Health Service Director, Rebecca Hamilton, RN, quickly came to get them. Hamilton, who has fostered homeless pets for years, was instrumental in advocating for this program, which was quickly approved by PACC as a way to save kittens and by the Catalina Springs Memory Care board as a positive way to enrich its residents’ lives. On Wednesday, several residents bottle-fed the kittens, who are transitioning to kibble and soft food. Turtle the Tortie weighs 1 pound, 2 ounces and Peaches the Buffy weighs 1 pound, 15 ounces. Once they reach 2 pounds, they will return to PACC for their spay surgeries, vaccinations and microchips; after that, they will be placed up for adoption. As resident Thelma Bradfield gleefully fed a kitten, her memory care issues did not stop her from fondly recalling being a young girl growing up on a farm. PACC officials said that community support is needed to sustain and grow their foster care program, which also helps puppies and adult dogs and cats. To become a foster volunteer, make a donation to PACC’s Medical Fund , or donate a foster-care item such as litter, formula or bottles from the shelter’s Amazon Wish List, visit PACC’s webpage.